Nice! are you going to work on a new Magnus the Red to go with this army as well? Wow, what an army! Every element ties together so well. Always happy to see more added but this force as it is, is breath taking. That looks awesome dude, keep up the great work. I love the colour scheme. Really tires the army together. The whole force has a great cohesion - though I think you need more bods on the ground for how many vehicles you've got there. That is a beautiful looking army! Agree with Muppet regarding the "Bodies on the Ground" aspect. 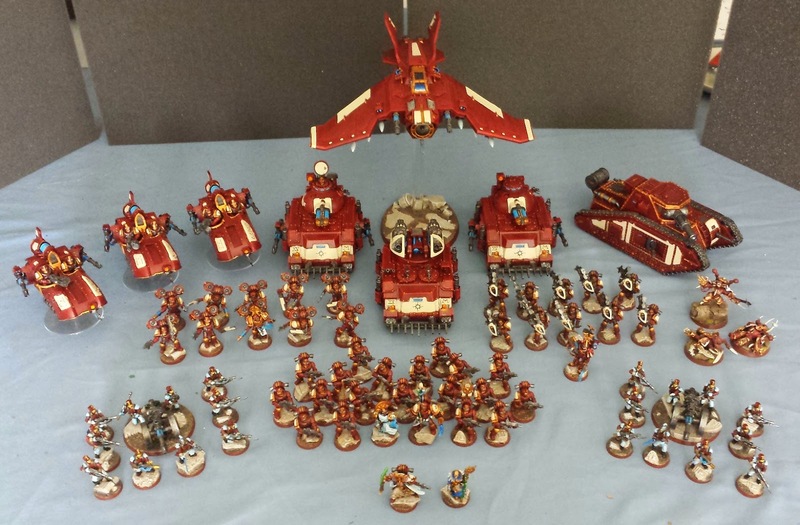 Otherwise though mate, this is your best looking army yet. Very frikken cool. Very impressive - when do we get to see them in battle? @#2501: Thanks! I've had my eye out for another Magnus model like the old one, but am also thinking I'll hold off for FW to do one - I'm sure it'll be epic! @Col. Ackland: Thanks very much, mate! @Frothing Muppet: Cheers bud! Aye, there's more infantry to come, for sure. @DaveTaylor: Thanks! I've been loving your DG, can't wait to see more! @LuckGod: Thanks! It's definitely a symphony in crimson. @Dai: Thanks very much! I'm planning on another couple support squads and a unit of terminators or two - definitely more to come! @Sir Tainly: Thanks! I'm gearing up for the usual July 4th battle, expect some pics this coming weekend! I really appreciate the kind words, everyone. Thanks again! Awesome work! .. the army picture looks great! Very awesome. Great family photo! @The Eye of Error: Cheers! It's always surprising to pull all the models out and realize how much is actually done!